The operating of hydraulic turbine influences turbine oils: their quality declines, with loss of its deaerating properties, foaming and deterioration of anti-corrosion and anti-wear properties and decrease of aging resistance. Such processes are inadmissible as they can lead to accidents and serious financial losses. In order to prevent it from happening, it is advised to process turbine oil (clean, filter and regenerate) significantly extending its service life. GlobeCore supplies this equipment to electric power industry. The inspection showed all plants at HEPP operating well and fully coping with their tasks, keeping the high quality of treatment after several years of operation. 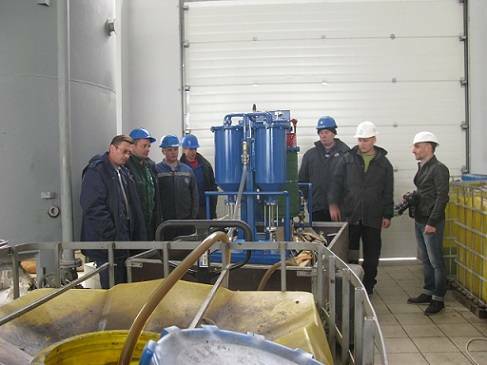 CMM-4Т oil purifier is operating since 2008 demonstrates especially good results. It performs complex purification of hydro turbines oil to 9th grade of cleanliness with original cleanliness of 13th grade. The CMM-4Т plant can be used not only in filtration mode but also in filtration, drying and degassing modes depending on condition of turbine oil. Visit to HEPP once again confirmed the highest quality of GlobeCore equipment as well as its readiness to solve the biggest challenges of electrical power equipment operation.